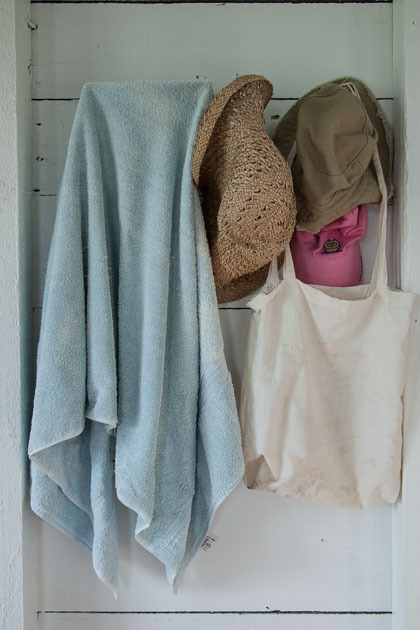 A towel hangs beside a straw hat and summer caps in a vacation cottage at Sakonnet Point, Little Compton, Rhode Island. Remember those “What did on my summer vacation” essays you had to write in school? No matter how much fun you had, how many places you went, how much time you spent exploring, enjoying, writing that essay was likely painful. I hated them. In deference to Mrs. Photographer, I just grabbed my walking-around camera this day, and took some photos in our friends’ summer place. It had been recently redone, but they had wisely retained it’s original bare studs and siding in the main room. It’s funny, but the even light extends to the interiors. (White-painted walls help!) It’s interesting to me that ordinary things, things that would often be overlooked, can take on real beauty in context and in unusual light. 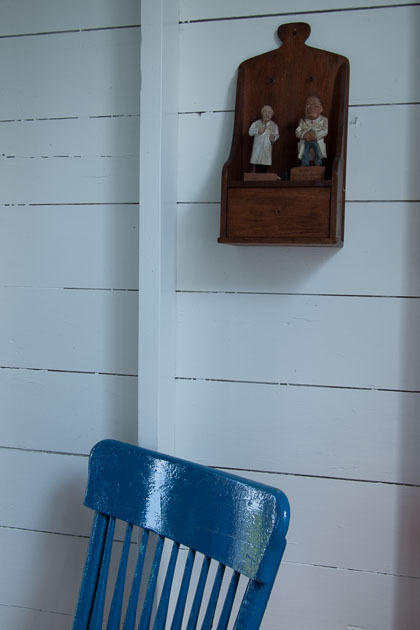 A blue chair and wall decor in a summer cottage, Sakonnet Point, Little Compton, Rhode Island. So if you haven’t gotten away this summer, or if you were stuck in some air-conditioned hotel somewhere, enjoy. More summer photos from Little Compton, RI here. Tech note: Non-geeks need read no further. All taken with an Olympus E-P2, Panasonic Lumix 20mm f/1.8 lens. Interior shots at ISO 200 to see how the IS works (not bad). 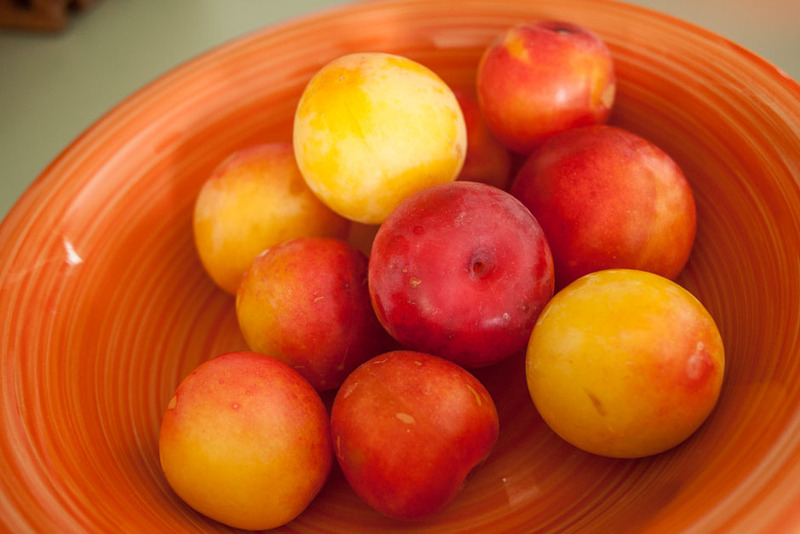 (Bowl of plums at ISO 400, clothespins at ISO 500). A little luminance noise reduction in Lightroom 3. Just got the Panasonic lens, and I’m liking it. Small and compact, sharp.